FDA Disclosure: CBD products are not approved by the FDA for the diagnosis, cure, mitigation, treatment, or prevention of any disease. While we publish and refer to currently available research on cannabidiol, terpenoids and other properties of hemp-derived cannabis oils, it is important to note: None of the products or information available on this website are intended to be a treatment protocol for any disease state. The information presented is for educational purposes only and is not intended to be an enticement to purchase, and should not be construed as medical advice or instruction. Links to third party websites do not constitute an endorsement of these organizations by Green Flower Botanicals, LLC and none should be inferred. The FDA would want us to remind you: You should always seek the advice of a physician before adding any supplements to your diet. 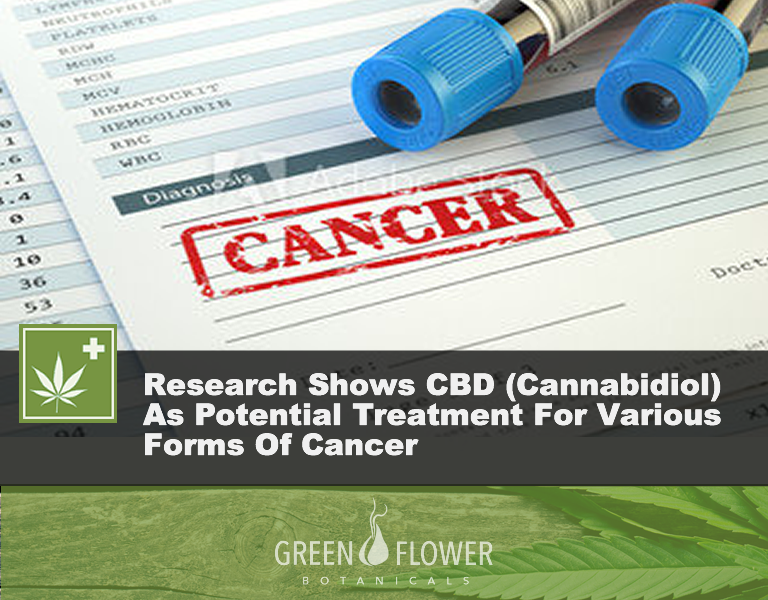 Cannabinoids – a new weapon against cancer? Cannabidiol Reduces Leukemic Cell Size – But Is It Important? Cannabinoid derivatives induce cell death in pancreatic MIA PaCa-2 cells via a receptor-independent mechanism. Cannabinoids induce apoptosis of pancreatic tumor cells via endoplasmic reticulum stress-related genes. The stress-regulated protein p8 mediates cannabinoid-induced apoptosis of tumor cells.